The Glyptodon standing in the corner adjacent to the Exley Science Center’s library is impossible to miss. It is, for one thing, utterly massive—its shell alone is about the size and shape of a Volkswagen Beetle. Add on the spiky tail and skull, and the whole effect is that of a threatening, oversized armadillo, which is appropriate, given that Glyptodons, which lived between 2 million and 10,000 years ago, are relatives of the modern armadillo. This one, based on its sheer size and terrifying tail, looks much more dangerous. This cast of a Glyptodon shell was unearthed in the tunnels beneath the Foss Hill dormitories, and its discovery is a part of a larger project of finding and cataloging pieces of the University’s natural history collection. In order to get it out from the tunnels over the summer, a team of Earth and Environmental Sciences (E&ES) professors and students had to remove doors from their hinges to fit the massive armored dome through it. The cast has been meticulously restored, repainted, and mounted. And amazingly, the tail that was originally attached to the shell was found in storage in Exley. For the first time in over 60 years, the two are reunited. To complete the look, Professor of Earth and Environmental Sciences Ellen Thomas ordered a Glyptodon skull online, and with that, the whole animal came together: a magnificent rendering of what these mammalian creatures looked like in the Pleistocene Epoch. The completed Glyptodon, unveiled to the world on Feb. 26, now stands proudly in Exley behind a red velvet rope. 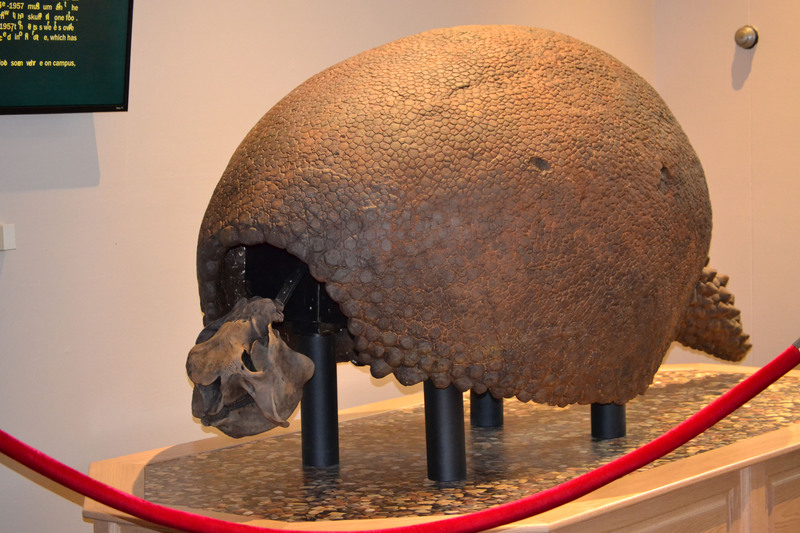 While one of the more sensational pieces of the University’s collection, this Glyptodon shell cast is one of many casts, pieces of taxidermy, fossils, minerals, and other natural material and memorabilia that the University has in storage. For the first time in half a century, these objects are resurfacing and receiving attention, categorization, and restoration. Thomas is leading a team of graduate and undergraduate students who are working to catalog and eventually display many of these amazing pieces, which have been gathering dust for far too long. But in order to get a picture of what’s happening now, we need to back up. Orange Judd, class of 1847, was the founder of the science museum where these items were originally housed. In 1871, Judd made a gift of about $100,000 to the University to fund the construction of Judd Hall, originally called the Orange Judd Hall of Natural Sciences. Judd’s son-in-law, George Brown Goode, became the first curator of the museum. According to Thomas, who has heavily researched this museum’s history, Judd was meant to be like a “cabinet of curiosities.” Its displays were rooted in the prevailing notion of natural philosophy, which involved the study of all natural material: ecology, zoology, paleontology, and even history and archaeology. On display at Judd was anything from large skeletal recreations of ancient fossils to minerals to taxidermic birds, and even archaeological items, like coins. Materials for this museum were acquired by a variety of means: purchases, research expeditions, donations, and exchanges with other museums. While the focus of the museum was scientific research, this at the time mainly revolved around a collection of specimens. Curators of this museum were aware of the public appeal of collections and therefore opened the museum up to the public. In its beginning years, Judd was a popular place for students, faculty, locals, and visitors of the area. Over the years, however, attendance and interest faded. When, S. Ward Loper, the third curator after Goode, died in 1910, no one replaced him and the care of the museum fell under faculty. Likewise, the prevailing mode of scientific inquiry began shifting from observation to experiment around this time. The massive collection of specimens fell out of use, and the demand for laboratories was prioritized over the nostalgia, intrigue, and beauty of museum collections. In the end, the museum was considered irrelevant and closed in 1957. This was originally thought to be a temporary decision, but the museum was never re-established. When the museum closed down, the materials it housed were placed hastily in the tunnels beneath Foss Hill (which perhaps ought to be called Fossil Hill, given the number of fossils that were stored there). During the next 15 or so years, the materials collected dust and mildew. Then, around the year 1970, many of these fossils and relics were moved to the storage room on the third floor of the newly built Exley Science Center. More were placed in “The Penthouse”—a rooftop storage-space of Exley. The largest pieces remained in the tunnels underneath the Fossil Hill dorms, while others still were donated or exchanged with other museums. Thomas notes that some pieces were even lent to local Middletown schools and never recovered. But over the summer of 2017, Thomas and various other staff members and students uncovered some of the items that had been all but lost to the world. Thomas notes that the adventures in the Foss Hill tunnels were incredibly exciting for her and others working on this research. Posting about it to the ongoing Joe Webb Peoples Museum blog, student Bright Palakarn ’20, who worked on this research over the summer, wrote of the discovery. Palakarn addressed the initial discovery of the Glyptodon, too. Although the finds themselves are exciting, the brunt of the team’s current work is in trying to figure out what each of these fossils is, and where it came from. Student Wisly Juganda ’20 has been doing some of this work, specifically on the University’s collection of brachiopods, which are marine-shelled animals abundant during the Paleozoic Era. In terms of figuring out where things are located, as aforementioned, the tunnels aren’t the only on-campus storage space for remnants from the old museum. Graduate student Melissa McKee B.A. ’17, M.A. ’18 spoke about the items in the Exley third-floor storage space. It’s true: In addition to fossils and minerals, within the third-floor storage room are taxidermic birds dating back to the 19th century. An owl sits in Thomas’ office, and McKee’s massive peacock perches on a stand in the storage room, along with many others. Biology Chair Ann Burke is in charge of the birds’ restoration; many of these taxidermic creatures will be getting new, glassy eyeballs, in addition to feather cleanings and various other treatments. Along with the birds, Thomas hopes to display some of the collection of bones, including a fabulous rhinoceros skull. Casts of dinosaur skeletons like the sea-dwelling Ichthyosaurus have already gone on display on the third floor of Exley; these remarkable displays greet visitors as they walk off the elevator and through the halls. A massive elephant skull will be appearing in Hall-Atwater. Thomas hopes that these items won’t just be confined to science buildings, and that one day, in Usdan and Olin, some of these marvelous specimens will be available for the public’s viewing pleasure. Many materials that didn’t get lost ended up in the Joe Webb Peoples Museum on the fourth floor of Exley. This museum houses many of the minerals in the University’s collection, along with drawers of fossils, and a fantastic buffalo named Greg. Researchers hope to expand this museum and are already doing so; new displays of fossils are currently being put up, along with outstanding artistic recreations of the ancient environments in which these animals would have lived. This is the intersection between art and natural history, something common in museum settings. Indeed, one of the most important aspects of this project is its intrinsic interdisciplinary nature. As Thomas notes, many of the students doing this work are not Earth and Environmental Science majors, and the project itself is grounded in not just biology and geology, but archeology, history, philosophy, and art. It also involves outreach and education, particularly in the local area. In this vein, Thomas is also working to create an exhibit in conjunction with the archeology department, involving a display of items made from shells next to a specimen of the species of shell used. This display will be an example of the archeological and ecological sides of natural history. Even the Glyptodon on display in Exley has a history of its own. The Glyptodon is a cast—not an original shell—and was made in the 19th century. The original fossil from which this cast was made was found in Argentina in 1846 and is currently located in a museum in Dijon, France. This cast of the animal was obtained by Judd Hall in the 1870s—for $150. The politics of these purchases and exchanges are murky and are wrapped up in the political tensions at the time. Although Thomas says this has been an ongoing project for some time, it’s nowhere near finished—the Glyptodon display, though exciting, is only the beginning. But Thomas and McKee did let themselves revel in the excitement of the display, which has been received well by University students and staff alike. “Now the tail and the shell are reunited after sixty years,” McKee said. “For the first time since 1957,” Thomas added proudly. Indeed, the union of the shell and tail is a historic moment. And it is only one of many to come.